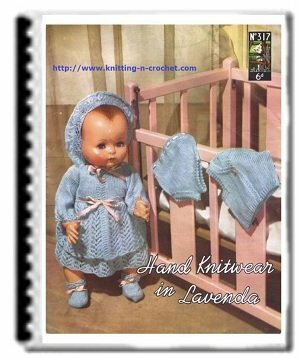 "Baby Set in Openwork Pattern"
Easy baby crochet patterns "Baby Set In Openwork" This is a great project for a beginner. 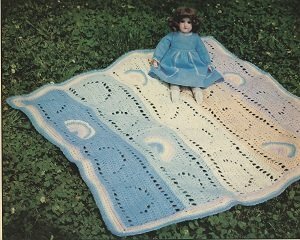 Crochet this set in a jiffy from two 2-ounce skeins of Orlon yarn in any desired color and one 2-ounce skein in a contrasting color. The directions are given for a 6-month size. Use a size crochet hook to correspond to weight of-yarn. Row 1: With MC, ch 57, dc in 8th ch from hook, dc in each of next 3 sts, * ch 2, sk 2 sts, dc in each of next 4 sts for a bl, repeat from * across, ending with a sp, making 9 sps and 8 bls in all, ch 3, turn. Row 2: * 2 dc in sp, dc in dc, ch 2, sk 2 dc, dc in next dc, repeat from * across, ending with 3 dc in last open sp, ch 5, turn. Row 3: * Sk 2 dc, dc in last dc, 2 dc over sp, dc in next dc, ch 2, repeat from * across, ch 3, turn. Repeat rows 2 and 3 until 20 rows are worked in all. This completes the back of jacket. Do not cut yarn. Repeat these two rows for 20 rows—same as for back. Fasten and cut yarn. Right Side of Front: Leave 5 sps across back for neck, join yarn and work same as for left side. Fasten off. Join CC in lower left hand corner of jacket, make a shell of (4 dc, ch 2, 4 dc) in corner, ch 5, sl st in 4th ch to form a p, ch 1, work 4 dc over each of next 2 sps with a p in between, p, shell in corner, 4 dc for a bl over each sp up front, around back and down right front, make a shell in corner sp, continue across bottom, making ps as on left front. Continue to work around lower edge of back in same manner and join to beginning. Join MC in middle of corner shell on left side, work a row of sps and bls up front, across back and down opposite front. Fasten off. sc in center of each bl instead of sp across back—thus forming a ruffle-like collar. Be sure to end with p, shell, p to correspond with beginning. Sleeve: Join MC in first dc of 6th bl from lower left corner, ch 5, making 17 sps and bls—begin and end with a sp. Row 2: 4 dc in each sp across with a ch 2 between.Work 6 rows in all. Fasten off. Cuff: Join CC, make 2 rows of sps and bls. Last Row: * Ch 2, sc in sp, ch 2, shell of (4 dc, ch 2, 4 dc) in next sp, repeat from * around, end with ch 2, sl st in third ch of last sp. Fasten off. Work a second sleeve in same manner. Join yarn two bls up from shell corner and weave underarm seams together. 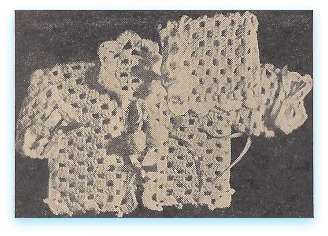 Weave ribbon in each sleeve edge. The sleeves may appear a little large but after ribbon is pulled up, they give a little puff effect. Make a crochet chain about 30 inches long, weave in and around neck of jacket. Fasten a pompon on each end. Cap—Row 1: With MC, ch 57, dc in 8th ch from hook, dc in each of next 3 sts, * ch 2, sk 2 ch, dc in each of next 4 chs for a bl, repeat from *, making 9 sps and 8 bls across, ending with a sp. Work 12 more rows of sps and bls. Fold piece in half and seam together to form back of cap. Fasten off. With MC, work a row of sps and bls across lower edge of cap. Fasten off. Join CC at a front corner, work a row of sps and bls across front. Work another row of sps and bls across front only. Work a row of shells across front and around back, join and fasten off. Weave a 10-inch length of ribbon through back. Weave 36-inch length of ribbon across front. Turn the three rows of contrast back across front.